Need your daily dose of vitamins? Drink Vitamin Water! Marketing is a very powerful thing. But being a conscious consumer and being aware of what you put into your body is an even more powerful thing. 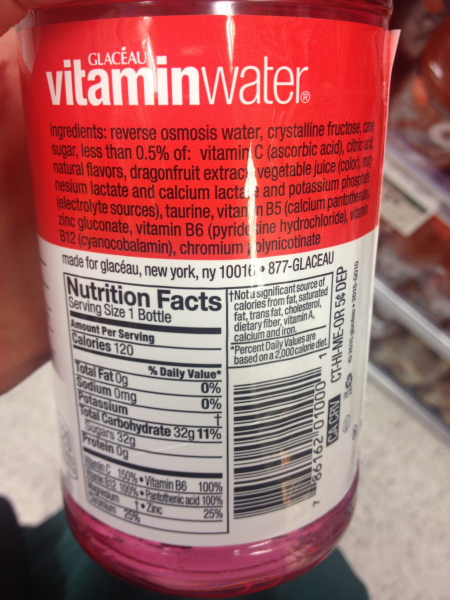 But look BEYOND the label and marketing…this Vitamin Water is one of the furthest things from healthy. LESS THAN .5% is the “vitamin” part of this drink. This drink has 32g of sugar in it. ONE drink. That doesn’t include anything else you are eating that day. Guys. If you eat a relatively healthy diet throughout the day, get your servings of vegetables, fruits, whole grains, protein and good fats…you will have ALL of these vitamins and SO much more. Bonus? You’re not putting crap in your body. Ideally, we would avoid things like “Vitamin Water” and everything else with processed sugar. But I know that’s not realistic for many of us (including me! ), nor is it fun. I’m all about BALANCE. Be conscious and informed about what you put in your body. Eat as much fresh, unpackaged foods as possible. Drink your Shakeology. But also enjoy going out for ice cream, having a drink with your friend, baking your significant other’s favorite cookies (maybe with a healthier recipe?? ;) ), eating greasy pizza at 1am on a Friday night. But don’t make it a daily thing. Health is about balance. Healthy comes from knowing your body and knowing what you put into your body. Be CONSCIOUS of marketing and labeling and understand that you’ll probably want to avoid stuff like “Vitamin Water,” or drink once in a great while. Hell, make your own “Vitamin Water” by putting fresh fruit slices and berries in your water. I LOVE putting lemon and lime or raspberries in my water.